A New Faster TNC for the Raspberry Pi! Brand New! : The new TNC-P9k6 supports packet data transmission speeds of 1200, 2400, and 9600 baud. You can send data up to 5 times faster than with the old TNC-Pi, for a very small increment in price. The new TNC-Pi9K6 is an easy to build kit that contains absolutely no surface mount parts. 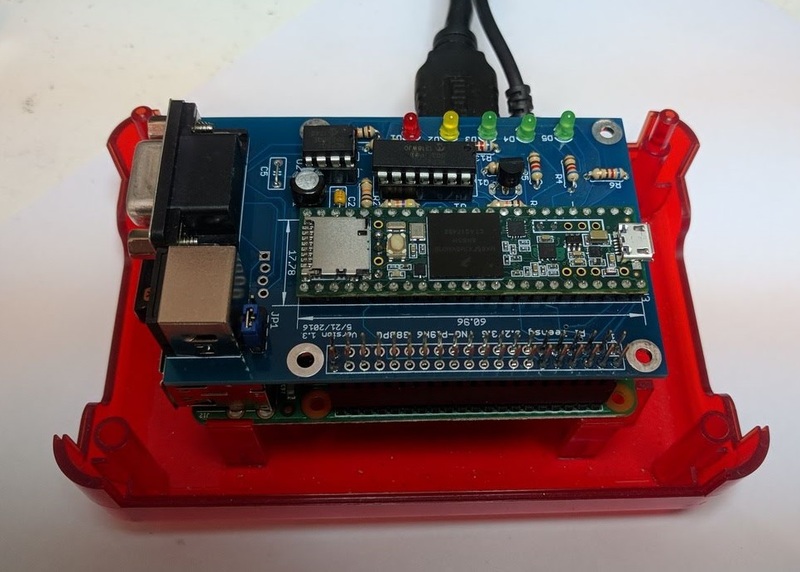 It is based on PJRC's Teensy board version 3.6. Caveats and Considerations: 9600 baud is not for everyone. You can not simply hook it up to any old FM transceiver and have it work. Don't even think about doing this with your Baofeng HT! Your best bet is to use a radio that has a separate connection for 9600 baud packet, such as a Kenwood TM-V71, TM-D700, TM-D710, Yaesu FT-7900 or similar. While some of the HF/VHF/UHF radios like the Yaesu FT-857 and FT-817 claim to be able to do this, early reports are that they receive properly, but have issues on transmit. If you can find an old 2 meter Yaesu FT-1500 it will also work and will be cheap. 9600 baud also requires more careful adjustment of the transmit audio than does 1200, so be prepared to spend some time getting it right. One last thing. This design is brand new. The manual is currently being written but you can see it progress here. The TNC is not currently available in a wired and tested version, but we expect that it will be when we get past the initial few months of orders. If you are planning on just using 1200 baud packet, you are better off using the TNC-Pi 2 for this purpose. It is cheaper and less complex than the TNC-Pi9K. But if you've been waiting for an opportunity to move up to 9600, here's your chance to do it at all time low price. But wait! There's more! If you have a hankering to do ARDOP, the new high speed HF digital mode, this board also supports it. To do this you will have to burn different firmware into the Teensy, but the software to do this is free and the process is not difficult. Additional modes may be available in the not too distant future that can be implemented with no additional hardware. If you have a radio that has a 6 pin mini-DIN connector for packet (FT-8900, IC-7000, Kenwood D710, etc), you can use a standard Mini-Din cable to connect them. These are available from many sources, but make sure you get one where all six wires are connected (many do not). If you like, you can buy one here. For stacking multiple TNC's you might find a male to female spacer useful.